Munnar, Kerala is one of the most popular destinations for visitors to the state, with both Indian honeymooners and foreign tourists. People don’t visit Munnar for the small scruffy town, but for the stunning green hills that surround it, and most of all for the tea. Munnar is the centre of Kerala tea production, and visitors can enjoy the breathtaking views of the tea plantation covered mountains, as well as sample the quality tea itself. The climate in Munnar at 1600m is much cooler than other parts of Kerala, with temperatures falling to 10 degrees celsius during the winter months. This makes it an ideal place for hiking, with plenty of beautiful walks to explore.It’s always a good idea to take warm clothes and rain gear. Take a Tour – You’ll need transportation to visit the tea planations and hills surrounding Munnar. Your hotel, any rickshaw driver or the Tourist Information Service (run by legendary Munnar-expert Joseph Iype) will be able to arrange a days sightseeing for you. Tata Tea Museum – The museum shows the basic process of making tea as well as old photos and machinery from the tea growing colonial era. 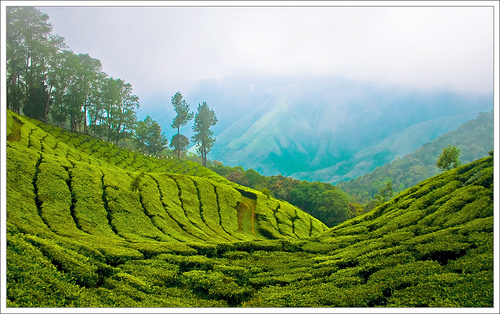 Trek – Walking is the best way to explore the tea plantations and hills up close. The Tourist Information Service can advise on routes, and the Green View Guesthouse runs a team of guides. Waterfalls – There are many beautiful waterfalls around Munnar. Attukal is one of the the most spectacular amongst jungle and hills. Top Station – This is the most popular excursion from Munnar. Top Station has spectacular views of the highest tea estates in India (see photo above). For the best views visit early in the morning before the mist builds ups. Kolukkumulai Estate – Top Station can get crowded with tourists so Kolukkumlai is a great alternative with even more incredible scenery. It is officially India’s highest tea plantation at 2400m, and can only be reached by jeep. Budget: Kappallil Resort has a range of rooms on offer, close to Munnar town but set in lovely gardens away from the hustle and bustle. Midrange: Rose Gardens Homestay is set in a peaceful cardamon plantation 10km from Munnar. The friendly family can arrange treks and cooking lessons. Luxury: Windermere Estate is a boutique country retreat set amongst cardamon and coffee plantations 4km outside of Munnar. The cottages are huge with spectacular views from the picture windows. For more options read our How to Find Great Kerala Accommodation post. Munnar can be reached by bus or car from Kochi (5.5 hours), Kottayam (5 hours) and Kumily (4.5 hours). If you are coming from Alleppey you can change buses in Kottayam. These times are for buses, but you should always allow extra time as there can be delays on the winding mountain roads. The views on the way are beautiful though. If you hire a car and driver the journey time can be reduced, and you can stop to take photos along the way. You can also reach Munnar by bus from Madurai (6 hours) or Coimbatore (6 hours) in Tamil Nadu. The journeys can be long but the views are stunning. The next Kerala India Travel post looks at quiet alternatives to Munnar, where you can enjoy hill station scenery without the crowds. It is part of a new series looking at off the beaten track places to visit in Kerala. This entry was posted on Sunday, January 24th, 2010 at 3:00 pm	and is filed under Kerala India Travel, Munnar Kerala. You can follow any responses to this entry through the RSS 2.0 feed. Both comments and pings are currently closed. The name Munnar is made up of two words – Moonnu (Three) and Aaru(river) referring to three rivers. It’s quite picturesque, especially in monsoon. Looks almost like a fantasy land with picture perfect tea estates. Howdy cheers for the last new entry. Which Kerala Beach is Right For You? Wordpress Sites by Line In Web Design.